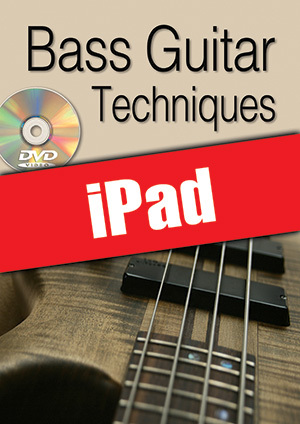 Bass Guitar Techniques (iPad) (BASS GUITAR, Courses for iPad, Bernie Cooper). In order to be able to express yourself freely with the instrument, a good technique is essential. But this technique should be discreet and become both natural and instinctive so that it can serve the music. This can be achieved by practising specific exercises like those presented throughout this method. This book details a vast practice programme covering the right hand technique first, with both the traditional and the so-called “floating thumb” positions and the different left hand techniques including physical exercises to loosen the fingers as well as preparatory exercises for hammer-ons, pull-offs, slides, and shifts. But this method doesn’t stop here! It will let you practise ghost notes, staccatos and accents not to mention chords, barring, tapping, harmonics, palm mute, picking and slap techniques. Throughout the different chapters, examples will help you to musically put these technical exercises into practice. The DVD gives you the opportunity to watch all the gestures in detail, which will definitely help you make technical progress. Since you are dealing here with the iPad version of the tutorial, the book and the DVD have been replaced by a tablet-optimized multimedia pack containing musical sheets, texts and videos.